With a record-setting 14 startup companies sharing nearly $650,000 in pre-seed funding, Alabama’s high-tech sector soared in 2015, courtesy of Alabama Launchpad. From heart monitors that provide data to cardiologists while patients are home to an affordable Web-based brewery-management platform, Launchpad Programs Director Greg Sheek said the visible diversification in the initiative’s 10th year surpassed all expectations. “Not only did we fund more companies than ever in our startup competition history, but we also provided funding to 11 companies through our Alabama SBIR/STTR Support Program. We saw an uptick in participation across our programs, and we continued to see great diversity in terms of ownership and industry sectors that participated,” Sheek said. Launchpad continues to see “a number” of female-owned and female-led companies, and industry representation in 2015 spanned everything from information technology and manufacturing to healthcare and live-streaming services, he said. “By adding fuel to the out-of-the-box thinking entrepreneurs who participate in our programs, we are diversifying Alabama’s economy and supporting the creation of high-growth jobs,” Sheek said. Since its inception in 2006, Alabama Launchpad has awarded $2.3 million to 51 companies, leading to 305 knowledge-based jobs and $20.4 million in follow-up funding. Designed to promote, reward and boost Alabama’s pipeline of innovative enterprises with the highest growth potential, Launchpad is the brainchild of the Economic Development Partnership of Alabama Foundation and is financed by business, the state of Alabama and seven universities. It represents the “renewal” component of Accelerate Alabama, the state’s broader, long-range economic development plan. Launchpad’s largest component allows “pre-seed” companies to compete in an entrepreneurial-infused environment for their share of as much as $250,000 in start-up funding per round. Competitors must prove to a five-judge panel their commercial relevance – with emphasis placed on the creation of high-wage, high-growth jobs. While known for providing startup capital in its Alabama Launchpad Startup Competition, the nonprofit organization added another program, the Alabama SBIR/STTR (Small Business Innovative Research/Small Business Technology Transfer) Assistance Program in 2014. The goal is to assist small businesses in getting a share of $2 billion in grants awarded annually by federal agencies to transform high-technology ideas into commercial products and new jobs. In addition, Launchpad awarded 11 companies $5,000 each in Phase 0 grants, intended to help SBIR applicants strengthen proposals and receive their share of grants. 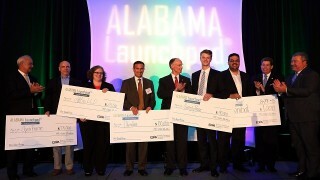 Launchpad recognized four Alabama companies as 2015 Innovation Award winners during its fifth annual Alabama Innovation and Entrepreneurship Conference in Birmingham. “The awards are not just a celebration for accomplishment, but they also help EDPA discover companies that contribute to the diversification of the economy and the creation of high-wage careers for Alabamians,” EDPA Vice President Angela Wier said.